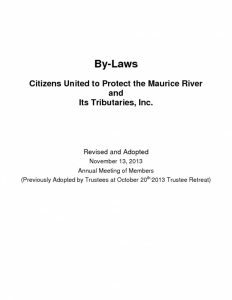 Citizens United to Protect the Maurice River and Its Tributaries, Inc. (CU Maurice River) is dedicated to protecting the watershed of the Maurice River and the region known as Down Jersey, thereby enabling current and future generations to enjoy the environmental, recreational, cultural, and scenic resources of this Wild & Scenic global treasure. CU Maurice River empowers individuals, organizations, and neighboring communities to promote the region’s enduring well-being and quality of life. 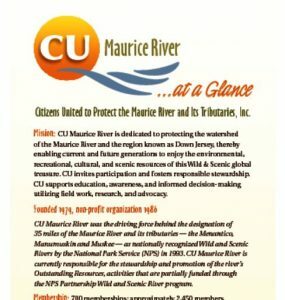 CU Maurice River invites participation and fosters responsible stewardship. CU Maurice River supports education, awareness, and informed decision-making utilizing fieldwork, research, and advocacy.